For the serious cyclist, doing your own repairs is a badge of honor. The more serious you get into riding, the more extensive your repairs will be. Having a dedicated bike repair stand can make reaching those tricky spots much easier. Finding the best bike repair stand for your needs means reading reviews, studying product features, and diving into the ins and outs of available attachments and configurations. With the right bike repair stand, regular maintenance and unexpected repairs can become a quick, over-and-done-with task. We reviewed dozens of bike repair stands to identify the best of the best, based on Amazon reviews, how well they performed in durability tests, cost, and other considerations. We narrowed our search down to 5 of the top-rated bike repair stands cycling enthusiasts can purchase to ensure a smooth ride. Cam-actuated clamp with adjustable jaws works with tubes of varying sizes. We’ve identified Park Tool PCS-10 Bike Repair Stand as the best bike repair stand out there. With a cam-actuated clamp with adjustable jaws and height adjustment, this bike repair stand is one that will keep your ride in tip top shape. These benefits allow you to make any repairs quickly and easily, so you can get back to hitting the road in less time. The Park Tool PCS-10 Bike Repair Stand took the top spot on our list of the best bike repair stands thanks to its cam-actuated clamp with adjustable jaws, and quick release height adjustment which makes repairing bikes of all shapes and sizes a cinch. The composite top tube allows for smooth 360-degree clamp rotation, and the 3-point leg system with reinforced center yolk offers superior stability while working. Those who purchased and reviewed this bike repair stand appreciated that this stand felt heavy and sturdy while working, and liked the quick release levers, which made making adjustments a breeze. Commenters mentioned that the ability to add a parts tray to the stand was an added bonus. With a price tag of about $187, it doesn’t come cheap, but the quality craftsmanship associated with the brand, as well as the ease of setup and use more than justifies that price. It has a rating of 4.5 on Amazon with nearly 700 people reviewing it, which we think goes a long way in convincing bike enthusiasts to make the investment. Tripod configuration ideal for use on flat or uneven surfaces. The Feedback Sports Sport Mechanic Bicycle Repair Stand took the runner-up spot on our list of the best bike repair stands, but is another great option for at-home bike repair needs. It features a tripod configuration, which makes it suitable for use on both flat and uneven surfaces. The height can be adjusted from 42-65 inches, and it folds into a 12.6 pound compact unit for convenient storage when not in use. Those who purchased and reviewed this bike repair stand appreciated the quality this stand offered for its price point. They said it was sturdy without being bulky, and yet still lightweight and compact enough for use while out on the road. Part swapping was easy, and people who ran into issues found the brand’s customer service to be top notch. It doesn’t come cheap, but the quality craftsmanship associated with the brand, as well as the ease of setup and use more than justifies that price. It has a rating of 4.5 on Amazon with nearly 200 people reviewing it, which we think goes a long way in convincing cycling enthusiasts to make the investment. A budget-friendly option that’s both lightweight and portable. The Noa Store Bike Repair Stand Rack is a solid choice for those looking for a bike repair stand that won’t break the bank. The heavy-duty frame is lighter than other models, without sacrificing on durability. The included magnetic tool tray has several compartments for different tools, and the telescoping stand adjusts from 41 to 75 inches and can hold bikes up to 66 pounds. A quick-release clamp locks the bike in place and rotates a full 360 degrees to provide easy access to every part of your bike, and this bike stand is also foldable for compact storage and portability. Those who purchased and reviewed this bike repair stand appreciated that it offered a good deal for the price, and found it sturdy, and while some say the instructions aren’t the best, most reviewers found it relatively easy to assemble. It does have a lower weight capacity than other more expensive bike stands, but the affordability is worth a bit of trade-off. With a price tag of under $50, this bike repair stand is a solid choice for those looking for a bike repair stand option on a budget. It has a rating of 4.1 on Amazon with about a dozen people reviewing it, which we think goes a long way in convincing cycling enthusiasts that this budget-friendly pick is just as good at handling repair needs as its more expensive counterparts. A compact and lightweight design ideal for use while out and about. 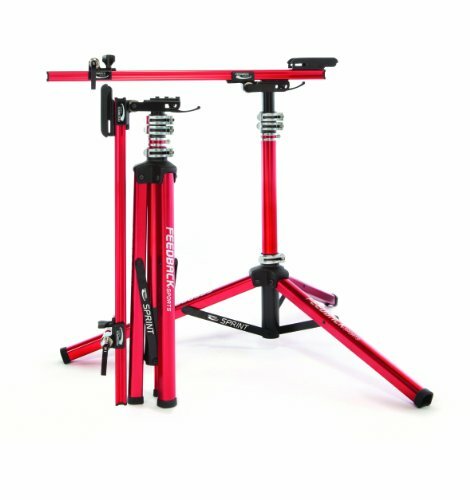 The Feedback Sports Sprint Work Stand is an excellent choice for those who want a bike stand they can take with them on their rides, as it quickly folds into a compact and lightweight package. It boasts a tripod configuration, suitable for use on both flat and uneven surfaces, and uses a traditional fork mount for increased stability. The fork mount is compatible with most bikes for added convenience. Those who purchased and reviewed this bike repair stand appreciated the sturdiness it offered in such as lightweight and portable package. People felt it had a good number of adjustment points, but several commented that such an expensive unit should include a storage bag. People liked that it came with a 3-year warranty, and found customer service to go above and beyond when any issues arose. It doesn’t come cheap, but the quality craftsmanship associated with the brand, as well as the ease of setup and use more than justifies that price. It has a rating of 4.9 on Amazon with nearly 100 people reviewing it, which we think goes a long way in convincing cycling enthusiasts to make the investment. Avoid the hassles of set up and take down with a wall-mounted unit. The Park Tool Deluxe Wall Mount Repair Stand is an excellent option for those who want a wall-mounted bike repair stand to avoid the hassles of having to set up and take down a regular repair stand. 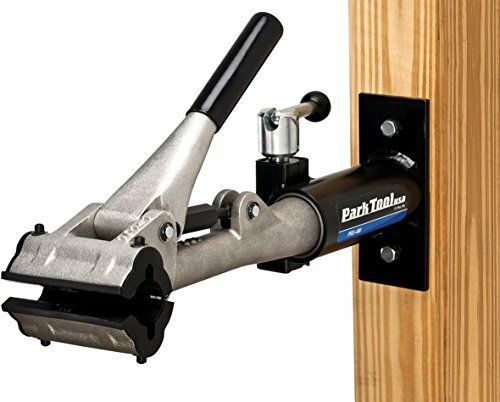 It boasts a durable die-cast aluminum, steel, and rubber construction, and installs in just minutes onto any post or wall stud. Those who purchased and reviewed bike repair stand appreciated that it offered professional level quality in an affordable package. Nearly everyone commented on how durable this unit was, and many liked that they were no longer tripping over their tripod bike stands after purchasing and installing this unit. People find mounting and unmounting is easy, and while it isn’t height adjustable, they felt the space-saving convenience of this model was worth the trade-off. With a price tag of around $193, it doesn’t come cheap, but the quality craftsmanship associated with the brand, as well as the ease of setup and use more than justifies that price. It has a rating of 4.5 on Amazon with more than 25 people reviewing it, which we think goes a long way in convincing cycling enthusiasts to make the investment. A bike repair stand is an ideal choice for those who ride on a regular basis, or want to be able to do their own repairs at home more easily. No longer just for the professional bike mechanic, bike repair stands are becoming more and more popular with cycling enthusiasts of all skill levels. If you’re doing your own bike tune-ups at home, a bike repair stand makes it easier to reach all components. A bike repair stand lifts the bicycle off the ground, and holds it at a comfortable working height. It also helps to keep your ride stable and secure while you make repairs, so that you can focus on the task at hand, rather than having to figure out how to hold the bike still while you make repairs. Freeing up both hands means that repairs are completed in less time and with greater ease. They are also convenient for washing your bike in between rides, and can help those with mobility issues to better reach various parts. You should also check out our reviews of the best bike pumps and the best bike racks. And, if you’re in the market for a new bike, we’ve also reviewed the best hybrid bikes. Style. Arguably the most important consideration is the style of bike stand you choose. There are a few different styles, including tube clamping workstands, axle/bottom bracket mount workstands, and wall-mounted workstands. Tube clamping workstands are the most common type, and either grab a frame tube or hold onto the seatpost to keep the bike secure for repairs. They aren’t compatible with all bike types, however, but for most cyclists they should be more than adequate. Axle/bottom bracket mount workstands are what most pro racers and mechanics use, as they allow the user to spin the bike easily to reach all spots, and boast a compact design. However, you must be able to remove one wheel in order to use it correctly. Finally, wall-mount stands are ideal for committed home bike mechanics, and are incredibly sturdy for tough repairs. That stability comes with a trade-off, in that they are not easily adjustable and require a permanent workspace. Angle and height adjustment. The ability to adjust the angle and height of the bike is very important for certain repairs, such as bleeding hydraulic brakes. The most important consideration here though is that the clamps and dials hold the settings securely. You don’t want to be working on the bike and have it slip out of position. Quick-release clamps make adjustments even easier, and are worth the added expense. Load capacity. While most bike stands offer enough capacity for the average road runner, if you’re working on gravity mountain bikes or even e-bikes, you’ll want a stand with a higher load capacity. Keep in mind that as the load capacity increases, the weight of the stand will also, making it less portable. Accessories. While not a must-have, accessories make using a bike repair stand more enjoyable. Things such as a carrying case or a tool tray allow you to take your bike repair stand with you on the go, and keep your tools and any hardware easily within arms reach. Price point. Finally, consider how much you are willing to spend on a bike repair stand. Bike repair stands vary in price from $75-$300 or more. Keep an eye out for end-of-year sales and manufacturer’s discounts that can make buying a bike repair stand more affordable. What is a bike repair stand and how does it work? A bike repair stand is a component that allows you to mount your bicycle securely in order to make repairs. It works by providing a stable base and stand that you can clamp the bike to, so that you have both hands free to work on the bike. Many units are height and angle adjustable, in order to help you get just the right position for making repairs to nearly any part of the bike with ease. What repairs do you need a bike stand for? A bike repair stand is useful for making repairs to the wheels, chains, brake, and gear system of a bicycle. A bike repair stand lifts the bike up so you can more easily reach components, and is also useful for washing your bike in between rides. Some bike repairs, such as adjusting your own derailleurs or cables, are nearly impossible to complete without a bike repair stand. How do you mount a bike repair stand? Mounting a permanent bike repair stand requires a post or wall stud in order to secure the unit. Once you’ve found an ideal location, remove all parts from the box and ensure you have the required mounting hardware and tools. Measure and mark where you want your stand to go, using whatever stool or stance you’ll use for working on the bike as a guideline. Screw the screws into the wall, and then attach the mounting arm and tube clamp. Tighten all screws securely, and you should be good to go. How do you use a portable bike repair stand? A portable bike repair stand is a great choice for those who want or need to make repairs while out and about, or don’t want to be committed to a single workspace at home. To use a portable bike repair stand, you’ll want to set up the base/legs, and then adjust the center pole to the correct height. Once the stand is set up and the clamps are secure, mount the tube into the clamp securely before adjusting the angle how you need it in order to make any repairs. When done, remove the bike from the clamp, and fold the stand back up. We looked at 20 other bike repair stands. Even though they didn’t make our 5 best bike repair stands list, they’re the best of the rest and each is still a great option for cycling enthusiasts looking to do their own repairs. The information you’ll need to compare each one is included with the listing. This heavy duty bike repair stand boasts a sturdy and high-quality iron frame construction, and comes complete with a work tray for securely holding tools and hardware. This heavy duty bike repair stand boasts a durable iron and plastic construction, along with four base legs to provide a sturdy hold for your bike repair needs. This heavy duty bike repair stand boasts an aluminum alloy and iron construction, and comes complete with a premium quick release clamp for getting your bike mounted with less hassle. 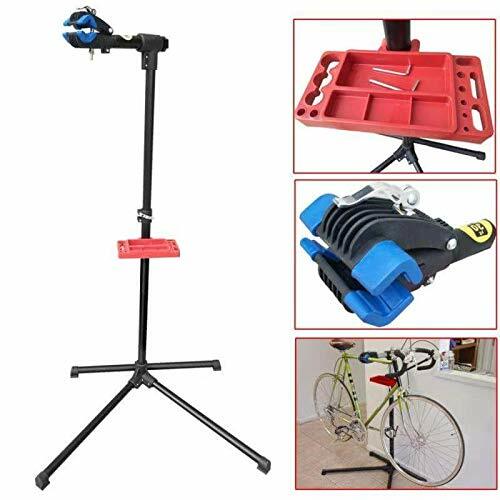 This heavy duty bike repair stand boasts a rotating head, which adjusts the clamp to any angle, and is height adjustable to get just the right position for any repair. This heavy duty bike repair stand boasts a telescopic arm clamp and rotates 360-degrees to get just the right position for repairs. This heavy duty bike repair stand boasts a height adjustable design and 360-degree indexed clamp rotating arm, along with a quick release mounting clamp. This portable bike repair stand boasts an ultra lightweight and compact design with a sturdy steel frame that makes it ideal for bringing along on long tips. This portable bike repair stand boasts a quick release height and angle adjustment for getting your bike into the best position, and quickly folds in one single piece. 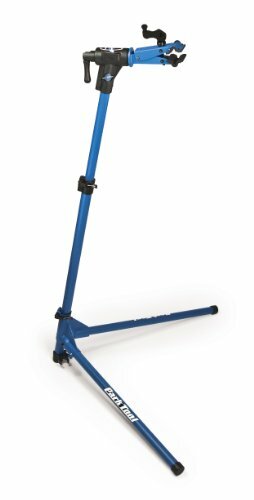 This portable bike repair stand boasts a telescoping height adjustable stand and arm, along with a quick release clamp which fits nearly all standard frames from 1-1.8-inches in diameter. This portable bike repair stand boasts a patented quick release secure-lock clamp with 360-degree rotation to provide a secure hold to your bike, and accommodates frames with up to 2.6-inch tubing. This portable bike repair stand boasts quick release height and angle adjustments, and comes complete with an integrated tool tray for added convenience. This portable bike repair stand boasts a durable aluminum alloy body, and comes complete with a rotating clamp that allows for clamping on the top tube or seatpost. This portable bike repair stand boasts a lightweight and durable iron tube construction, and features four telescoping legs for use on flat or uneven surfaces. This portable bike repair stand boasts a quality reinforced aluminum frame, and comes complete with height and angle adjustments to help hold your bike in just the right position. This wall mount bike repair stand features a rotating clamp which allows you to clamp on the top tube or seatpost for increased versatility. This wall mount bike repair stand is made from high quality steel and plastic components, and boasts a 360-degree rotating clamp that can accommodate frames from 25-40mm in diameter. This wall mount bike repair stand boasts a sturdy steel construction, and the mounting flange has five holes to provide increased stability for repairs. This wall mount bike repair stand comes complete with a quick release adjustable clamp, and folds up for convenient space-saving storage when not in use. 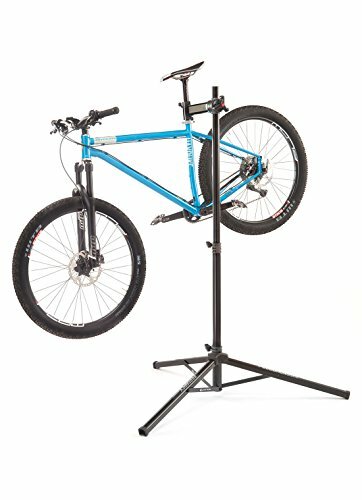 This wall mount bike repair stand boasts a quick release adjustment clamp, and comes complete with all required mounting hardware for added convenience. This wall mount bike repair stand easily mounts to any post or wall stud, and boasts a sturdy steel construction and quick release clamp that accommodates tubes from 30-75mm.